Dairygold, the Irish dairy co-operative, has announced that its annual turnover rose by €27.4 million to a record €992.9 million in its 2018 financial year. However, the extreme weather conditions experienced in 2018 had a severe impact at farm level. As a co-operative, Dairygold responded by supporting milk and grain prices and introducing a range of farmer supports for farmers. Dairygold supported farm gate milk prices by in excess of €15 million above market returns, while delivering an operating profit of €28.9 million, a reduction of €3.5 million on the 2017 performance. Since 2009 and primarily as a result of the deregulation of the milk quota regime, Dairygold has seen its milk volumes grow by about 500 million litres, a 60% increase, with milk solids (protein and butter fat content) increasing by 70% over the same period. Dairygold Milk Suppliers are projected to increase their annual milk production volume to circa 1.65 billion litres by 2023. In 2018, the Society committed a further investment of €130 million to ensure it continues to process all its members’ milk. This investment is across three significant projects in County Cork. These comprise of: the establishment of a new cheese manufacturing facility in Mogeely, in partnership with TINE SA of Norway; increasing the demineralised whey ingredients capacity at the Castlefarm Dairy Complex in Mitchelstown and the installation of another evaporation and drying system at the Nutritionals Campus in Mallow. All three projects are scheduled to be operational by 2020. Dairygold will have invested over €300 million between Phase I and Phase II Primary Processing, between 2012 and 2020, to support the growth in milk production across its catchment area in Munster. In addition, Dairygold’s strategic partners will have invested a further €120 million in processing capacity on its production facilities. 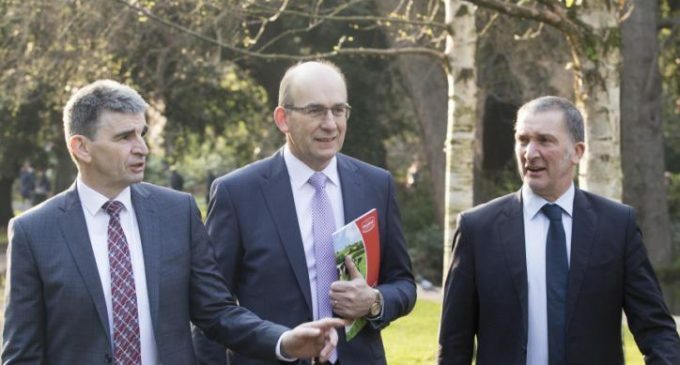 Pictured at the announcement of Dairygold’s annual financial results for 2018 are (left to right); Michael Harte, chief financial officer of Dairygold; Jim Woulfe, chief executive of Dairygold; and John O’ Gorman, chairman of Dairygold.